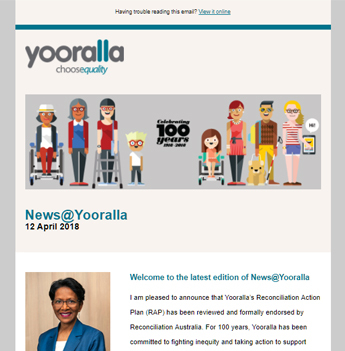 Yooralla supports schools by providing therapists and education support officers in a more flexible approach to supporting children with disability. Our staff are trained disability specialists providing a holistic approach to supporting the needs of every student. We provide support at a ‘whole of school’ level, from tailored support for individual students and groups, to the professional development and mentoring of teaching staff. This enables your school to better meet the needs of children with a disability and foster a culture of inclusion and respect. Yooralla currently provides services to children in government and independent primary and secondary schools across Victoria. Support to children with disability in a school setting is often required on an intermittent basis. This can create difficulty for schools employing therapists or education support officers. Yooralla offers a flexible approach and can provide skilled staff to support your school. Our services are a quality, cost effective, efficient and on-demand way to engage staff, while saving your school from all administration requirements associated with staff employment and payroll. Yooralla provides group workshops, mentoring and coaching to staff in schools. All workshops are delivered by professionally trained Yooralla staff and are available in modified formats for both primary and secondary schools. Yooralla also facilitates a range of learning circles and local networks to provide additional and ongoing support.